In the first part we used a Google Sheet with Longitude and Latitude values and associated the values with our dimension City. In this part we will now use the information and take a look at the Geo Visualization options in Cloud for Analytics. So I started by creating a new story and adding a new empty canvas. and we can now start configuring the map. On the Layer part we have the choice between a Bubble Layer, Choropleth, Heat Layer, Point of Interest, Feature Layer. I assume that most of you are familiar with the Bubble Layer, Heat Layer, and the Choropleth layer. The Point of Interest Layer is something that you model separate and you can then display it (without a measure associated to it) on the map. An example would be something like (remember I am from Canada) all locations from Tim Hortons. A feature layer allows you to use a web service URL in combination with ESRI for that particular layer. In our example lets start with the Bubble Layer. for the Location Dimension I can now choosing my cities – so far you do not have the option to assign directly the Longitude and Latitude dimensions. I then used the measure Revenue for the color and did select a color palette and chose 5 ranges. and the next step somehow reminded me of the first time maps were possible for Design Studio. The map zoomed out, tried to center the map around all my data and I could not find some configuration details were I was able to configure the Zoom Level or the start location (added to the Wishlist). The Basemap option provided me with several options to choose from…. … and the Map Filters is something we will explore next time. Basically the Map Filter allows you to find data points in a certain range / distance. Somehow Screens are now changed in SAP Analytics , had to map . When I look at the Google map latitude and longitude with more numbers is graphed correctly but when I look for the coordinates that were generated by the view, this is not recognized. What can I do to be able to visualize the map with the coordinates in BO Cloud? 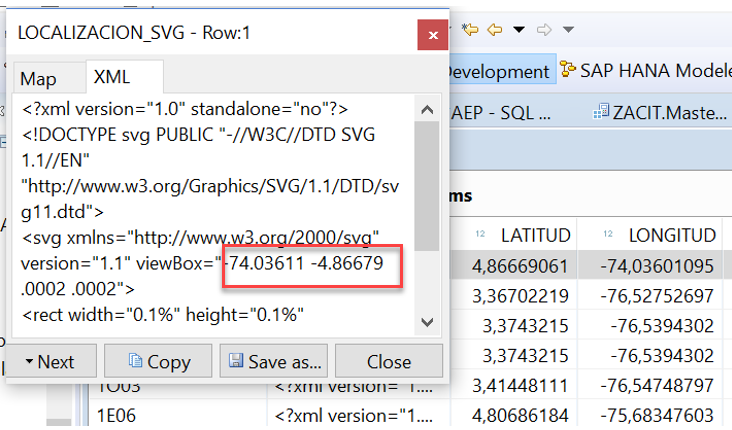 Try changing the data type of your coordinates to double instead of decimal.